03:20:00 Makes 10 servings, 1/10 recipe (92 g) each. Makes 10 servings, 1/10 recipe (92 g) each. This no-bake jelly dessert is fresh, fruity and flavourful. 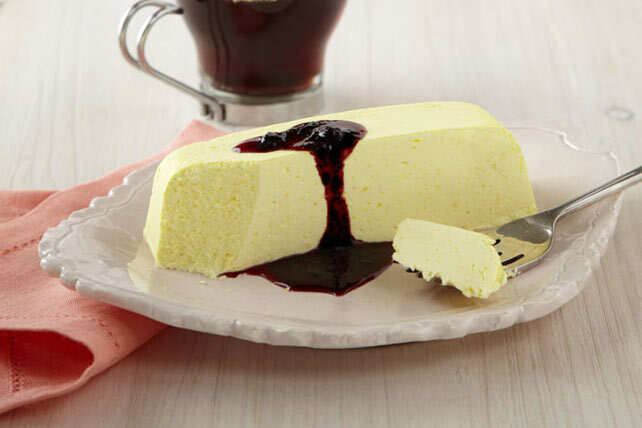 Enjoy a slice of this citrus dessert with a topping of homemade blueberry sauce. Add boiling water to jelly powders in medium bowl; stir 2 min. until completely dissolved. Reserve 2 Tbsp. orange juice for later use. Add remaining juice and ice to jelly; stir until ice is melted. Refrigerate 10 min. or until slightly thickened. Whisk in Cool Whip and zest; pour into 9x5-inch loaf pan sprayed with cooking spray. Refrigerate 3 hours or until firm. Unmold just before serving. Add reserved orange juice to blender with remaining ingredients; blend until smooth. Spoon over individual servings of dessert. Prepare using frozen raspberries. Strain through sieve before spooning over individual servings. To unmold, dip bottom of pan in warm water for 15 sec., then invert onto platter. For more simply stunning dessert recipes, visit www.dessertcentre.ca. This delicious fruit terrine can be part of a healthful eating plan. Serving Size Makes 10 servings, 1/10 recipe (92 g) each.